Metabolomics researchers who are looking for a faster, simpler complete solution to perform routine, high-throughput metabolic profiling can look no further. The SCIEX X500R QTOF System, powered by SCIEX OS Software making it easier than ever to operate, is an everyday, robust mass spec system with the performance you need to power through your experiments and deliver results you can trust. 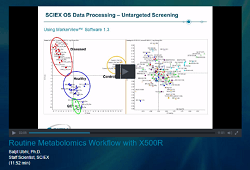 Videos – Get to know SCIEX OS, see the new interface and how to process metabolomics data libraries, how to build methods, and how to optimize and tune the system. Who will benefit? Biomarker Researchers, Biologists, Principal Investigators, and Laboratory Scientists engaging in basic or applied metabolomics research in the areas of biomarker discovery, clinical research, pharma and biopharma drug discovery, bioprocessing, or food and environmental metabolism research.